Note: Yarns are 100% superwash merino wool from Baah, Sonoma weight in Brazilian Emerald, Blue Iris, and Grape Vine (all purchased at Cakes and Purls in downtown Berkeley). 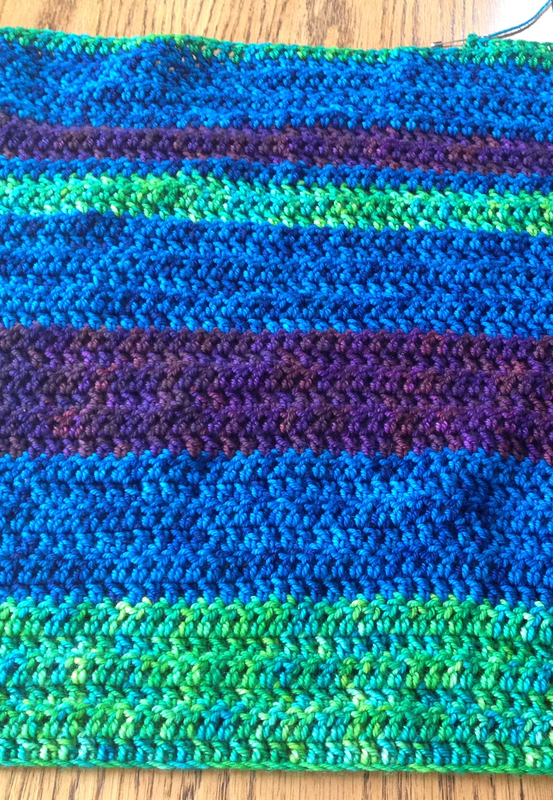 I'm doing stripes always in a green-blue-purple-blue-green-blue-purple order, but varying the widths in ways that make sense to me but probably not to anyone else. *shrug* I like to crochet wherever the wind blows when I'm doing this kind of project. Right now (at the top in the photos), I'm working on another thick green stripe (like at the bottom in these photos). Then there will be another thick blue stripe. Then maybe thin purple, thin blue, thin green, thick blue, and thick purple. *shrug* Something like that. And that might take me to the end. I'll see when the yarn runs out. 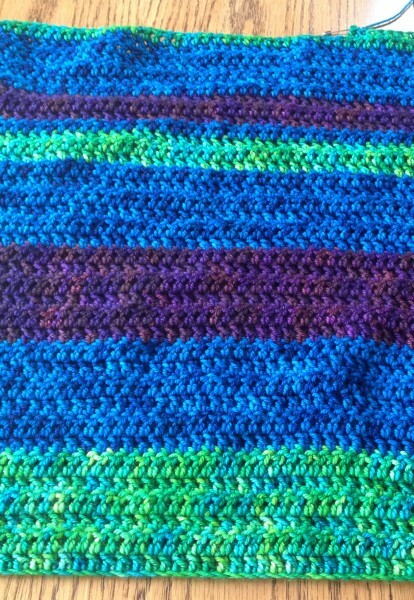 And I might change my mind about the widths of the stripes as I go. It's a headache-distraction relaxation project, not a plan-it-all-rigidly project.